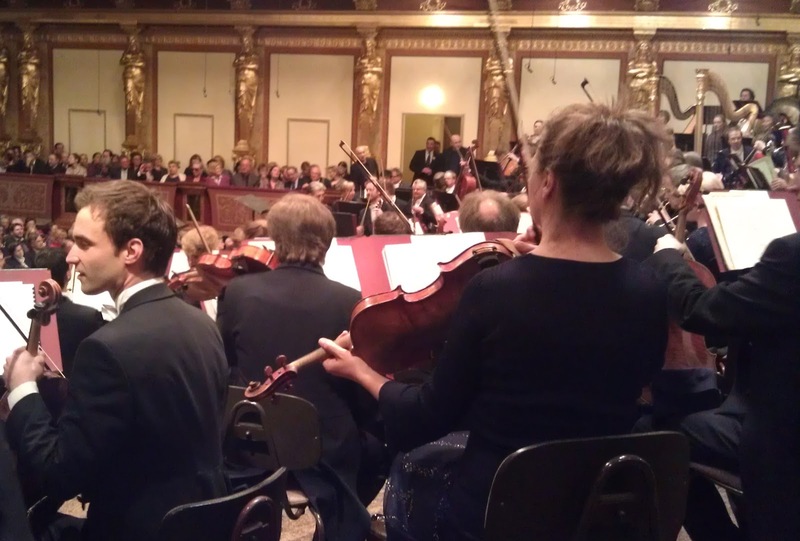 Loyal readers of this blog will recall from my last post that in the past forty-something years I have attended (or tried to) three performances of Mahler’s Das Lied von der Erde (Song of the Earth) at Vienna’s Musikverein, and three times something has gone badly wrong. I feared that something untoward would also happen the fourth time I went to hear this music on Thursday. My fears were realized. The jinx lives on. Things went so swimmingly at the beginning of the Thursday night concert that I thought my jinx had, at last, been lifted. At the last moment, I had avoided stehplatz (standing room) by scoring a ticket in the front row of the orchestra right seats. 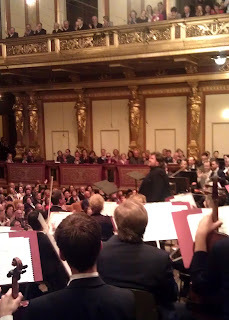 I found myself sitting on the podium directly behind the last row of violinists to the right of the conductor as he faces them. In fact, a couple of the violinists were sitting so close to me that I could reach out and dope slap them if they messed up. 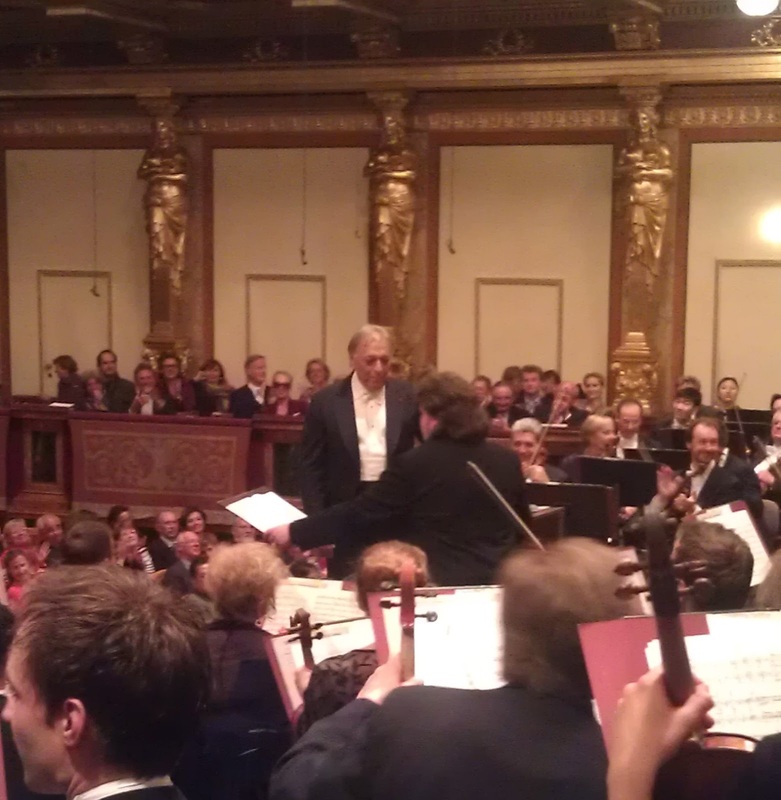 The first part of the program was played smartly by the Munich Philharmonic with world famous Zubin Mehta conducting. Mehta had made his Vienna conducting debut in March 1962, and he ranks among the world’s best. 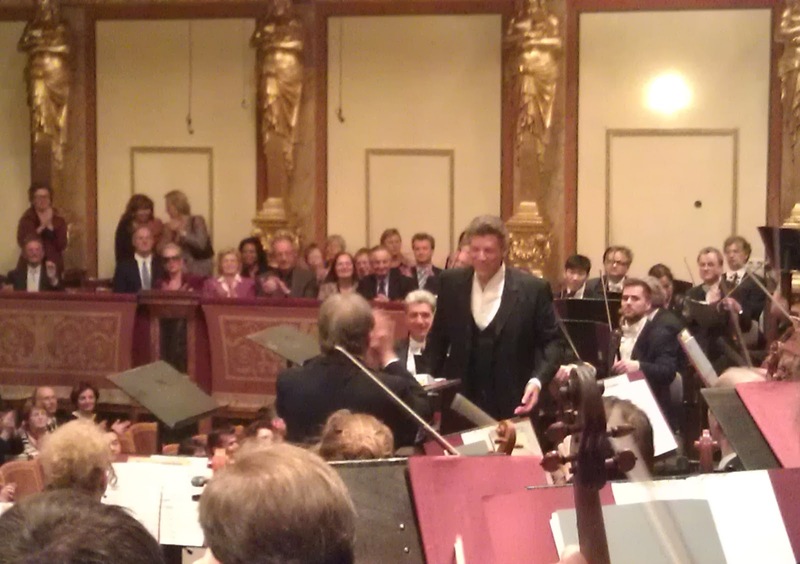 It was a treat to be facing the Meister, watching how he used gestures and facial expressions to lead the orchestra. The first piece was by Franz Schubert, likely because the Musikverein is celebrating its 200th anniversary this year, and Schubert was there in its early years. The second piece was the Austrian premier of a composition by German Moritz Eggert (b. 1965), who was present to hear it played. Its title is “‘Puls’ for Grosses Orchester.” The opening of the composition grabs your attention, and it is easy to get caught up in the pulsating, vigorous music that fully uses all parts of the large orchestra. 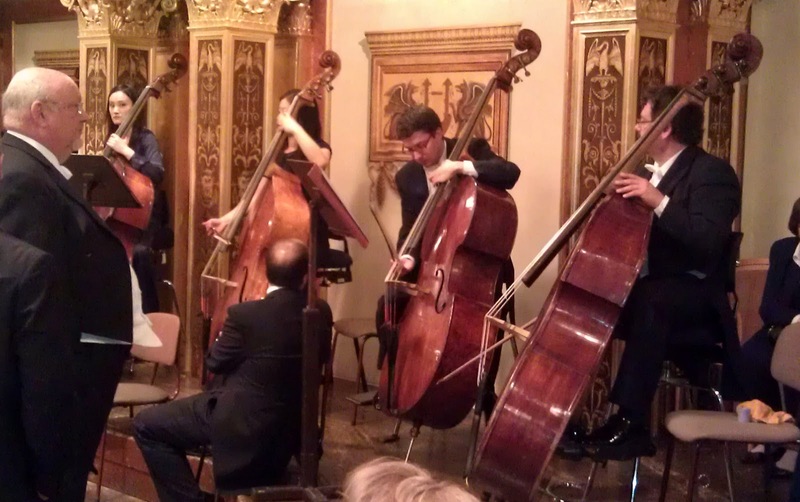 Not only do violinists and brass players work up a sweat, the tuba player, the harpists, and the percussionists are fully engaged in some strenuous playing. This music is a keeper. The break came and memories of the jinx were fading. As I waited, I read through the lyrics of the six songs that comprise Das Lied von der Erde. With two experienced and highly praised singers engaged to sing these songs, my expectations were rising. Then, strange things began to happen. The intermission seemed to stretch out much too long. The audience members came back to their seats, but the orchestra did not take the stage. After five minutes or so, a buzz was rising in the hall. At that point, a sad looking man came on stage to speak to the audience. Sitting behind him, I did not fully understand what he was saying, but the gist was this: Torsten Kerl, the tenor who was to sing in Das Lied von der Erde, had, a few minutes earlier, a "breakdown" and would be unable to sing. Dark murmurs arose from the audience. This man, who I would guess is the manager of the Musikverein, continued to explain what was going to happen. They had contacted a substitute singer who had agreed to take on the role, and he was on his way to the Musikverein. They had decided to proceed with the playing of Das Lied von der Erde in the following way: Thomas Hampson, the baritone, would sing the first two songs for baritone, No. 2 Der Einsame in Herbst (The Solitary One in Autumn) and No. 4 Von der Schoenheit (Of Beauty). Then, there would likely be a break until the second singer was ready. He would then sing the songs for tenor, No. 1 Das Trinklied vom Jammer der Erde (Drinking Song to the Misery of the Earth), No. 3 Von der Jugend (Of Youth) and No. 5. Der Trunkene im Fruehling (The Drunkard in Spring). 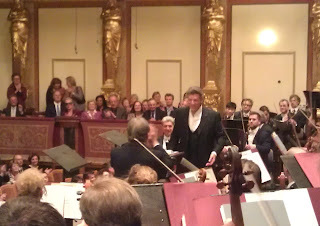 After that, Hampson would return for the final song, Der Abschied (The Farewell). The man asked the audience for its patience and understanding. He said that nothing like this had happened before in his twenty-four years at the Musikverein. I weep much in my solitude. gently to dry my bitter tears? Then he sang Of Beauty. I had been pleased to read in Hampson’s bio that he was born and raised in Washington State and had gone on to have a spectacular career as a concert singer. He had successfully sung Mahler’s work many times, and he was in good form this evening, even amid the turmoil surrounding the performance. When Hampson finished his first two songs, the sad man came out again to address the audience, saying that it would be at least ten minutes before the concert could resume. In fact, it was more than twenty minutes. Some of the musicians left the stage; others hung around talking, fiddling with their instruments, and reading magazines. A few members of the audience got their umbrellas and left. 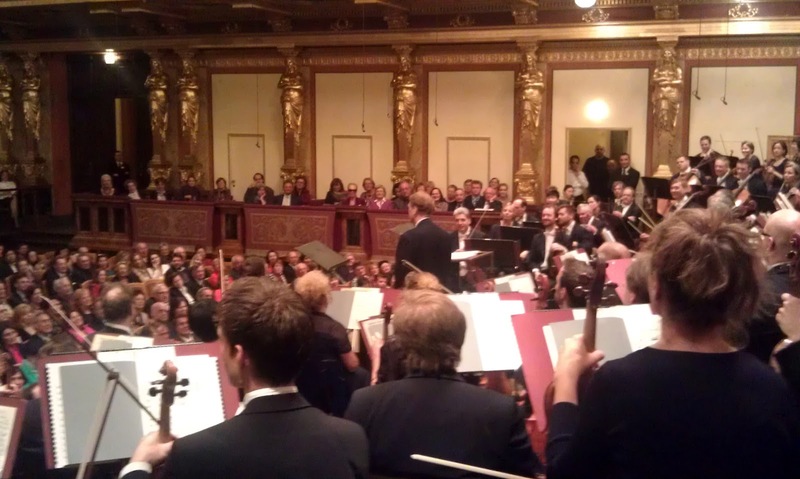 After the long delay, the orchestra returned to their chairs and the audience to its seats. The sad man appeared for a third time and introduced the substitute singer, whose name met with the approval of much of the audience. He was Johan Botha, who often sings in Vienna State Operas’ Wagner productions. The sad man said that Botha had not sung the songs of Das Lied von der Erde for many years and had no practice singing them with the Munich Philharmonic. Then he again asked for patience and understanding as he walked, head down, from the stage. crouches a wild, ghostly figure - It is an ape! in the sweet fragrance of life! Now take the wine! Now is the time - enjoy! Empty the golden goblet to the bottom! why then the misery and torment? It was engrossing to watch the old pro Mehta working with Botha to help him enter the music on the right note and at the right time. Mehta’s head was inches from Botha’s as he swung his baton, flicked glances at his musicians, and animatedly mouthed the words to the songs, especially emphasizing the words that followed seconds or minutes of music without words. Botha easily won over the crowd with his efforts and the audience, breaking tradition, applauded after each song. Botha’s wonderful voice rewarded those who remained despite their dismay at the changes in the program and the long delays. on this earth, fortune has not been kind to me! Where do I go? I will go, wander in the mountains. I wander to find my homeland, my home. I will never stray to foreign lands. Quiet is my heart, waiting for its hour! At the end, Hampson led us down the lonely road of eternity: ewig…ewig…ewig. The audience rewarded Mehta (who was visibly relieved that disaster had been averted), the two fine signers, and the marvelous Philharmonic orchestra with long and enthusiastic applause. There is no word about how the victim of my jinx, Torsten Kerl, is doing. All I can do is echo the manager of the Musikverein asking for his patience and understanding. This is a really funny description, Dan - the story of your "Lied der Erde" - ongoing jinx is incredible. Thank you very much for your comments. What a surprise! Also, congratulations on the successful Austrian premier of "Puls." It was a delight to hear it performed, and clearly your composition was enjoyed and much appreciated by the Musikverein audience.